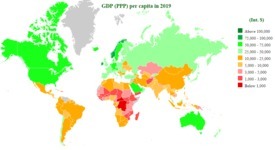 GDP per capita is calculated by dividing GDP by midyear population. GDP is the total market value of all final goods and services produced in a country in a given year. To make meaningful comparison, PPP is used to compare economies and incomes of people by adjusting for differences in prices in different countries. Qatar is the richest country of the world in PPP terms with per capita income around of Int. $128,487 in 2018 followed by Macao SAR (Int. $118,099). Luxembourg, which has highest GDP per capita in nominal terms, is at 3rd position. Per capita income of Qatar is over 7 times to the world's average of $18,120 and around of 160 times of lowest ranked Central African Republic of International $712. There are 23 economies which have per capita income above $50,000, 63 have above $25,000 and 113 has above $10,000 at purchasing power parity basis. 79 economies have per capita income greater than global average. three economies have less than $1,000. Top Gainers in 2018: GDP per capita of world has increased by 844 Int. dollar in 2018 at current prices. Macao SAR is top gainer in per capita income as its added Int. $8,125 more in 2018. Next top gainers are : Ireland, Qatar, Singapore, and Luxembourg are other top gainers. 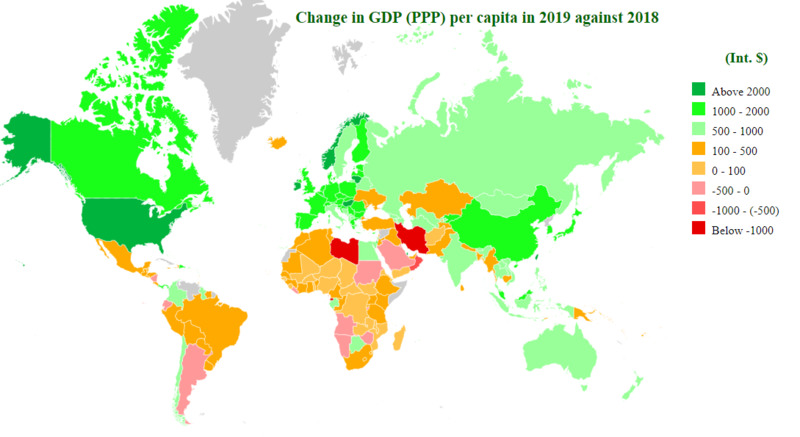 Top Losers in 2018: At current prices, Out of 192 economies estimated by IMF, GDP per capita of 13 economies have decreased in 2018. Equatorial Guinea is biggest loser as its gdp per capita figure has declined by $2,981. Venezuela and Dominica has also lost more than $1,000. Changes in rank: China and Georgia climbed up by 4 positions in World GDP (ppp) per capita Ranking. Libya and Latvia moved 2 positions up each. top five rank losers are : Venezuela (-8), Dominica (-6), Equatorial Guinea (-6), Papua New Guinea (-4) and Yemen (-4).